Ralph’s Radio in Vancouver and Victoria offer a variety of Rockford Fosgate marine audio upgrade solutions. 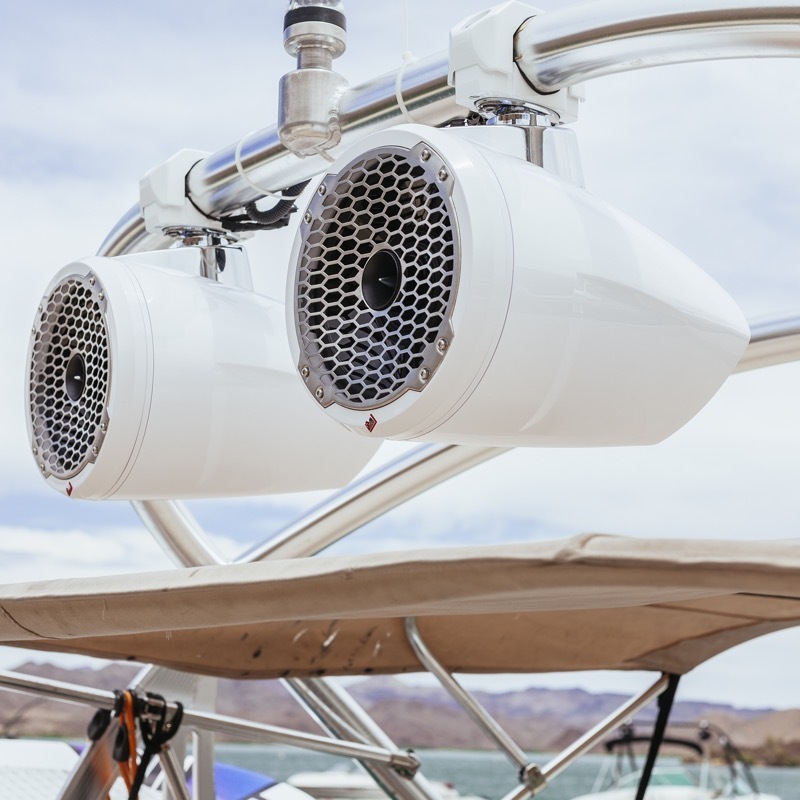 Whether you have a small jet boat or an ocean-worthy cruiser, we can tailor our entertainment system upgrade solutions to meet your expectations. Let’s look at some of the most popular Rockford solutions we offer. The PMX-8BB is a hide-away black-box-style digital media source unit that includes an AM/FM/Weatherband tuner, Bluetooth audio streaming and a USB port to play MP3 and WMA audio files. The unit includes four control zones and has provisions for three optional wired remotes. Finally, an optional NMEA2000 CAN integration module will allow the PMX-8BB to work with a variety of multifunction displays from companies like Raymarine. The PMX-8DH is a full-function remote display with a 5-inch colour screen designed specifically for the PMX-8BB. The fully water-resistant design features an IPX6 rating so you know the unit will last for years, even when exposed to harshest weather conditions. A large rotary volume control and back-lit control buttons make the system easy to use, day or night. As part of the Power Series of amps from Rockford, the TM1000X5ad is a 1,000-watt, five-channel amp that offers incredible sound quality and efficiency. The four main channels of the amp can produce up to 100 watts each and deliver smooth sound from 20Hz to 20kHz. The subwoofer channel of the amp can provide up to 600 watts to ensure the bass in your music comes through loud and clear, even when the throttle is pinned. The compact 1.6- by 4.3- by 12-inch dimensions of this amp make it easy for our team to install in almost any application. Rockford offers Element-Ready marine speakers in two series: Prime and Punch. The Punch Series PM282 8-inch coaxial marine speakers deliver impressive sound and great bass. These speakers use materials like Centrex 814 for structural components to withstand long-term salt and UV exposure that would cause a conventional home or car audio speaker to disintegrate. Rockford mounted the 1-inch tweeter from the PM282 on a bridge above the woofer rather than on a pole piece. This design increases the effective cone area of the woofer for improved efficiency and low-frequency performance. The PM282 is available in white or black finish with stainless steel grilles. Producing great bass on a boat can be difficult. With a large open space, you need a subwoofer that can handle a lot of power and move a lot of air. The Rockford Fosgate marine PM212S4 12-inch subwoofer is great at producing clear, deep bass, thanks to its 300-watt power handling capabilities and cone excursion rating of almost an inch. This impressive sub features the same weather-resistant construction materials as the PM282 speakers to ensure that your music will sound great for years and years. Whether you bring your boat to our Victoria location or the new store at 1490 Venables St. in Vancouver, or have one of our mobile teams come to your location at the water, the experts at Ralph’s Radio make marine audio ugprades easy. For more information, give our location nearest to you a call or send us an e-mail using our contact page.